This expansion and renovation project increased the plant’s water output from 90 million gallons to 120 million gallons per day. Phase I involved the construction of a new South Treatment Facility and Phase II consisted of additions and renovations to the existing facility. 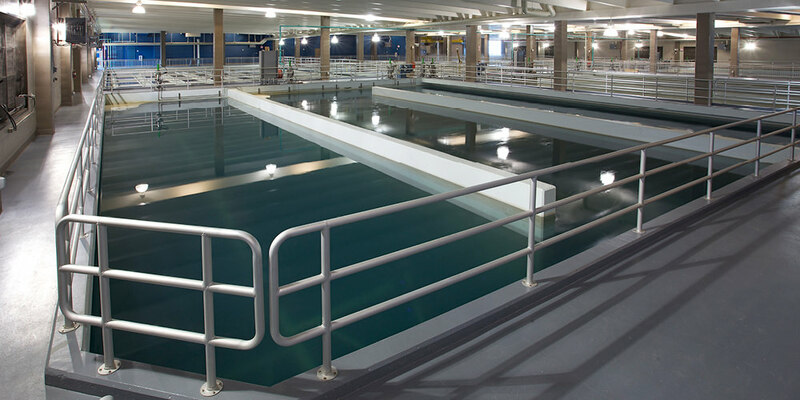 Coordinating the new South Treatment Facility with the processes of the existing water treatment plant required connecting major underground infrastructure to the existing operational plant without compromising service or quality, and fully testing all new systems prior to integrating them into the existing facility. Phase II required complete relocation and renovation of the facilities laboratory and operational offices, and removal of and conversion from the existing chlorine gas treatment system to sodium hypochlorite chemical feed injection system. Granger utilized mobile trailer units installed with scientific equipment and temporary sampling piping and controls to serve as a temporary laboratory and operations center, allowing the plant to remain fully functional during construction. Major selective demolition of existing plant structure, systems and interiors. Complete SCADA system upgrade and integration of the new South Treatment Plant. Commissioning was performed as a joint effort with team members from the design engineer, controls and instrumentation subcontractor, mechanical and electrical subcontractor and Granger. Granger self-performed all of the concrete work which exceeded 26,000 cubic yards.